Palin's speech last week has some former aides grumbling. WASHINGTON (CNN) - Some of Sarah Palin's former campaign aides are frustrated with the Alaska governor for remarking in a lengthy, freewheeling speech that she had refused to pray with them before last October's vice presidential debate. Palin told the story in a speech to a GOP dinner in Alaska last Friday. "So I'm looking around for somebody to pray with, I just need maybe a little help, maybe a little extra," she said of the moments before the debate. "And the McCain campaign, love 'em, you know, they're a lot of people around me, but nobody I could find that I wanted to hold hands with and pray." As the audience laughed, Palin noted that she meant no disrespect to the McCain campaign and that ended up saying a prayer with her daughter Piper. A handful of the McCain campaign staffers who traveled with the former vice presidential nominee nearly every day for two months caught wind of Palin's remarks on Thursday morning - and they aren't thrilled with her quip. "We all talked this A.M.," said one former Palin aide in an e-mail. "This set off a nerve for sure with a lot of people." "It's yet another example of the few staff still loyal to Palin questioning their loyalty and ardent defense of her over the several months since the campaign," said the aide, who was granted anonymity to speak candidly about campaign colleagues. Since election day, Palin has publicly griped about the way she was handled by the McCain team and pushed back against some of the campaign advisers who attacked her anonymously in the press. But another former staffer said that in doing so, Palin is failing to distinguish between the strategists at McCain headquarters and the people who were at her side every day from late August through election day. "It's about us people who were on the plane, who showed extreme loyalty to Palin, continually getting thrown under the bus or slapped in the face by her comments, whether she means it or not," the staffer said, adding that Palin's remarks "cause you to question not only your loyalty but her judgment as a leader." 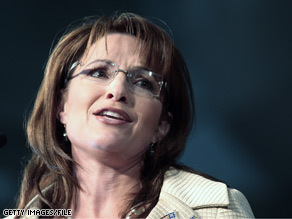 The former aides said they place part of the blame for Palin's post-campaign candor on the governor's staff in Alaska. Several have reached out individually to offer advice or assistance to the governor, but "have gotten only pleasantries in response," said one aide. "Who is the one making the decision that she needs to be out there saying these things?," the second staffer asked. "Someone needs to be telling her, 'Listen, let's not talk the campaign any more.' We need to talk about what's relevant and thinking about her influence as a voice in the Republican Party." "The people that she has, either working at her PAC or advisers in Alaska, aren't exactly making the best decisions for her," the staffer said. Palin's office in Alaska did not respond to a request for comment. So if you're surrounded by people and NONE of them are people you WANT to hold hands with, who is the issue really with?? All those people, or maybe it's just you with the issue. For a woman who cannot stand the media, she sure is in the spotlight every single day. I think it is time for us to turn her off! I think the people are finally seeing what most of us saw early on with Sarah Palin and that is a lack of leadership qualities. She can't speak well in front of a crowd and has to be prompted and when not prompted she says the wrong things..............she just isn't cut out for anything higher than what her job is today. She needs to just focus on her current job and not speak much about anything outside her territory. Has this moron ever taken responsibility for her own actions? The last time I checked, the GOP loved to define itself as the "party of personal responsibility." Of course, we've seen that this applies to everyone else and not themselves. Its difficult to believe that Ms. Palin is a Governor. When is she going to accept responsibility for her actions or misactions that led to her unsuccessful bid for the Vice-Presidency? Her latest tirade is childish and extremely unprofessional. This woman has got to "grow up!" Or better yet, get out of politics. This woman brings a bad image to girls in politics. But the good thing is that America has seen strong women in politics. Recently starting from the frist woman secretary of the state (dem) and Rice (Republicans) and now democrat. All this is Macain's fault. It seems that this guy is growing old and did not know what he was doing. He is only interested in pretty girls starting from his wife buity...models. The only thing Palin knows is that how to compit in the area of pretty girls ( by the way modeling in bikini is not something a conservative religious person shuldn;t do? How did it work for palin to model in bikini for her buity contest?) but politics is out of her scope. But Macain pulled her in to it just to tread in in woman figure What do you expect? Governor Palin can best build her credibility by attending to the business of Alaska, which I believe is a full time job. Dwelling on the past election willl not be of any benefit to her, given how all of her comments are publicized. My advice is to leave the past behind and diligently do the job she was elected to do. The best way for her to make future plans is to be working in the present. Is there anyone left for Palin to blame? She keeps talking about how she doesn't want to whine, but that seems to be the sum and substance of her comments.. how is she going to make it to 2012 if she keeps going through scapegoats at this speed? Sarah, just blame it on a Vast Left Wing Conspiracy. Because we all know how well that worked as a policital scare tactic when the other side tried it..
Sarah Palin is a paragon of virtue. Anything that goes wrong simply MUST be someone else's fault. Palin should learn to take blame for her own failures in the election too. Saying such think in public is not helping her image. She should take the high road like McCain and stop whining. What a phony hypocrite this Palin woman is! She wants to pray before a campaign event, and then goes out in front of a crowd to incite and encourage some of the most hateful, vitriolic shouts and crowd behavior we have ever seen in a presidential campaign! Her own words were highly incendiary and devisive – definitely not the rhetoric or demeanor we would expect from a "Christian" woman. Palin continues to make me want to puke every time I see her face or hear her grating voice! I dont think I can recall anyone so consumed with herself as Palin. Her biggest problem is that she has zero depth or political instinct. When was the last time you heard her speak about anything of substance other then herself, her clothes, her daughter, how people treated her, how the media treated her, etc. Its all about her. I think the republican party had best make it clear to her now that there is no way they are going to field her for anything so she might as well quit trying to capture the cameras with her constant "ME, ME ME" mantra. The party has a real problem here. She is a continued and increasing distraction to where the party needs to be and where its going. She is hilarious. I love her! She is as far polically as she needs to go. She would fit right in in Congress, though. Not that we need anymore dufuses running around Washington. It is truly sad when the most intelligent republican is Ron Paul and he's darn near certifiable. But a rather likable guy nonetheless. As a lifelong concervative Republican this was my first ever vote for a Democratic ticket. What swung me over was watching the Katie Couric interview of Sarah Palin. I said to myself after witnessing that disater.....and she could be a heartbeat from the Presidency. My only amazement is that as many people as did voted for McCain/Palin. If they saw the same performance I did with Couric and still voted that way...then I'm at a complete loss. She was REALLY scary during that conversation,it wasnt just bungling her answers, she seemed at times to be utterly incompetent. Anyhow, it's over and she'll no doubt stay on as one of the Republican "stars" and who knows if she can get up to speed on world affairs, learn how to answer questions directly and intelligently and avoid any further Couric type disasters she might just be a player??? She's certainly pleasant to behold!!! Growing up, I used to constantly hear the line that "God helps those who help themselves." What Palin needs is a speech coach, and to read more than she obviously does. People who read a lot are a lot more able to speak in coherent sentences. Palin to me is emblematic of a generation that spent more time watching TV than they ever did reading, And you betcha' that's the truth. I AM praying for her and I'm sticking with her, along with a few million others. And you must be worried about her because you can't seem to stop trashing her. Won't make any difference, people. You know, it's a slippery slope when current events turns into celebrity gossip. At what point does it enter the Britney and Brangelina phase of checkout aisle non-news? Technically Palin's still a governor so it's kind of political news, but it's just juvenile bickering that has nothing to do with governing so it's really not. Hmmm, confusing. Praying is a good thing to me. But using it to Whine for attention Is not! Sarah, anythime you need to pray with someone, I'll pray with you, if the former staffers have a problem with some of the things she says, obviusliy they didn't tell her what the stradegy was they had in mind for her, so they are the ones to blame, Sarah is a babe and the commie left liberal media has nothing better to say or do because their moronic hopeful CVliton didn't make it to where she wanted to be, Sarag, you keep doing what your doing! Given what we just heard about the war (s) we still have to fight, I suggest Governor Palin figure out that praying doesn't have to be a team sport. We all need to be praying for God's mercy. In groups, individually, sincerly and humbly, etc. I don't blame anyone for not joining hands with someone if they feel it's just being done for show. How could she possibly know what's in the hearts and minds of the people who were around her at that time. We should never second guess anyone's faith. WOW... She strikes again. I am so glad that she did not become the Vice Pres. I would personally like to see a woman in the highest offices but I believe that Palin would have done a great deal in setting women in politics back. Palin has shown that in public the least said the better for everyone involved. Please go back to Alaska and stay there before you can cause anymore damage. This type of off the cuff remark is why she sets the hair on the back of my neck to rise! Really you needed to pray but none of the people you worked with for months was good enough to pray with...interesting if not just plain stupid.She has a real problem knowing when to say what and to whom I hope she keeps it up. I would hate for any of the people she wants to vote for her for President to think she was a real person, with normal ideas. So none of the people that were tying to help you win, that actually thought well of you... were not good enough to pray with? And your still blaming your failure on the media? Really??? I am no republican and did not vote for McCain but I still am highly insulted by this. If you are one with God, you are one with all and should not hesitate to hold hands with a mouse if need be to pray. Without McCain, no one would know who this woman is! So I guess the McCain camp is like those folks in Virginia...you know the ones Palin said ARE NOT NORMAL AMERICANS. This woman needs a reality check and with this hypocritical type of thinking and acting, she could never ever be a fair and impartial President for ALL people. Dean Dunham, I couldn't have said it better!!!! Thanks for the great comment!! Has this woman ever said anything of substance? Ever? Just once?